“Do come for Drinks And Nibbles”. So easily uttered. So sorely regretted. Gone are the days when a bowl of Twiglets and a hedgehog of cheddar and pineapple sticks would suffice. And GBBO champion Style-Over-Substance-Done-Good-Frances, I might add, has a lot to answer for in upping the stakes further still with her astonishing allotment canapes. Anyway, I’m not, as you can imagine, one to fiddle around with such things. And I do not believe in poaching quails eggs. Or in vol-au-vents. I prefer the Venetian approach to nibbles: ciccheti – chunky mouthfuls of gutsy flavours, unpretentiously served with every glass of Aperol spritzer supped so authentically by every true Venetian. And that’s what I’ve been working on this week. No reason. No guests. No Drinks Do. No impending small talk. Just an urge to make canapes…. (yes, fine, odd, I know). The home of ciccheti in the UK, Polpo is a beacon for bold flavours and relaxed eating. It is too a goldmine for anyone in need of canape ideas that don’t feel as po-faced as Margo from The Good Life. Made from store cupboard ingredients, these may sound humble but by golly they taste amazing. The recipe is here. Inspired by the Ottolenghi recipe here, I choose to tinker a little and add caraway seeds to half the batch instead of poppy seeds. Seems to work and adds a little variety. Hardly even a recipe, I’m almost ashamed to mention it. But isn’t that what a good nibble should be – a super simple combination of flavours? Well, that’s my line and I’m sticking to it. Find some first rate salami. This one is fennel salami from work. Lay it out next to a pot of cornichons. Invite guests to wrap the cornichon in the salami, scoff, then wipe their salami-greased hands down their frocks. Do NOT, even when faced with the dry-cleaning bill, attempt to pre-wrap the cornichons and secure them on cocktail sticks. It looks ridiculous. 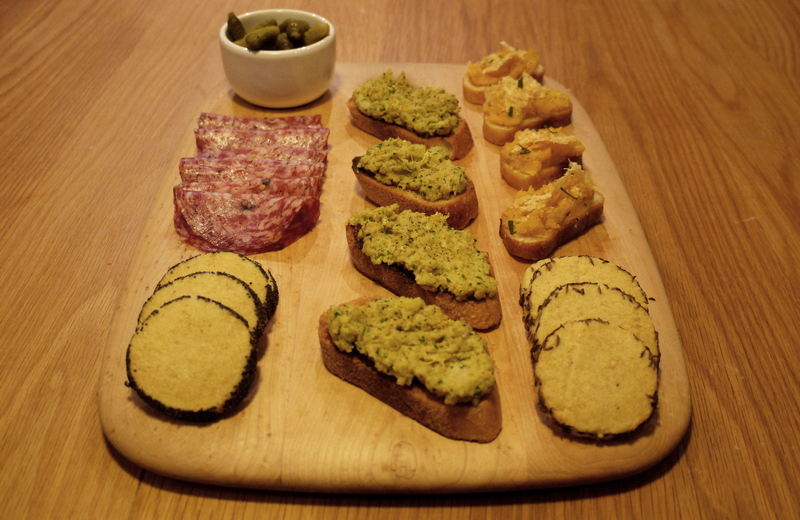 There is another lot of canapes in the picture – the yellow crostini. I won’t give you the recipe. Because they were lousy. It’s butternut squash if you must know, but it has the texture of cold mashed potato on toast and I can do nothing to recommend it. And so, the canape fever only slightly sated, expect more later this week….